Portugal's Antonio Felix da Costa on Saturday ushered in a new era for Formula E by winning the inaugural round of the 2018-19 season in Saudi Arabia followed by Techeetah’s Jean-Eric Vergne and Jerome d’Ambrosio in the Mahindra car. Da Costa was on pole from the beginning of the race and led away from the line, despite lining up at the front of the grid pointing toward the outside wall at a dusty and overcast Ad Diriyah circuit, reported Arab News. The Portuguese driver held on to the victory ahead of Vergne and Ambrosio in front of a large crowd. His Royal Highness Prince Salman bin Hamad Al Khalifa, Crown Prince, Deputy Supreme Commander and First Deputy Prime Minister, too attended the Saudi Arabia’s inaugural Ad Diriyah E-Prix. The Crown Prince expressed his delight at the opportunity to attend Formula E’s first fixture in Riyadh, noting that the Ad Diriyah E-Prix reflects Saudi Arabia’s efforts to promote the Arabian Gulf as a leading destination for sporting events. The Crown Prince also emphasised that the 2018 Ad Diriyah E-Prix, which featured the competitive debut of the Gen2 car, reinforces the region’s contribution to advancing motorsports. 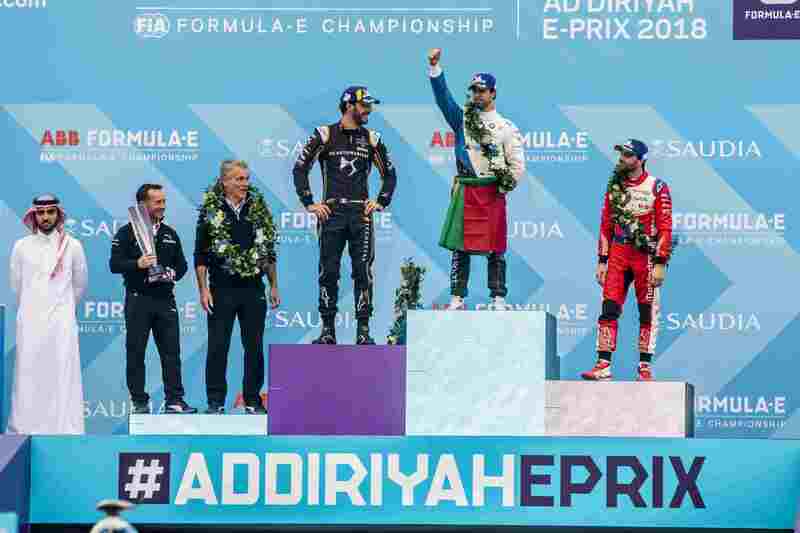 The Saudia Ad Diriyah E-Prix saw 22 champion drivers from 11 countries, including Germany, United Kingdom, the Netherlands, New Zealand, Belgium, France, Brazil, Portugal, Thailand, Argentina, and Switzerland, competing for top honours. On the race day, Swiss driver Sebastien Buemi had the best start on the grid after he blasted by Jose Maria Lopez around the outside of the first corner from third place. The front four pulled away from the rest of the pack, before Vergne — who started the race in fifth — passed Lopez on lap one of what would become a 33-lap race, with his teammate Andre Lotterer also getting past the Geox Dragon driver, said the report. As da Costa consolidated his lead, Vergne was closing in on Buemi, eventually passing him in a great move around the outside on lap nine. The Frenchman then set about reeling in da Costa, with the Portuguese offering fierce resistance. Vergne was then forced to serve drive-through penalties – just after he had used his first “attack mode” – for going exceeding the permitted power while using his “re-gen,” which put paid to him getting a victory. “It is amazing, it’s been really tough and long months of work, but I am really happy with that,” said da Costa after the win. “We definitely have some work to do as the two Techeetah cars were really fast, and even with (Vergne’s) drive through penalty, he was right there at the end. But it’s a good start and we’ll keep working on that and try to keep it going,” he added.